Usage To stop re-occurrence of kidney & urinary stones. 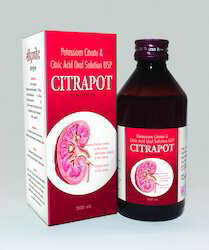 Potassium Ciitrate Monohydrate IP 1100 mg.
Citric Acid Monohydrate I.P. 334 mg.
For Prevention of recurrence of Urinary Stones. Relief from burning micturition.Renal Tubular acidosis. To be taken strictly according to Physician’s Instructions, and always diluted in a glass of water. 200ml pet ambar coloured Bottle. Disodium Hydrogen Citrate I.P. 1.37gm. 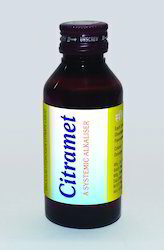 A systemic Alkaliser to render the urine alkaline in Pyelitis, Cystitis, Urethritis. Looking for Alkalizer Syrup ?